Tyne Rivers Trust, the environmental charity which runs the largest countryside stewardship fund in the north, has been working with its volunteers to help farmers to deliver practical works to reduce the level of agricultural pollution that enters the river. 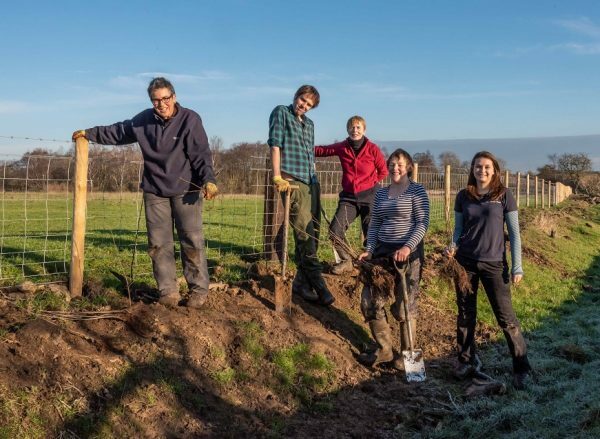 As the Tyne catchment is not a catchment sensitive farming area, it can be challenging for farmers to access funding so the Trust has been working with its team of skilled volunteers to support farmers in carrying out improvements such as hedge laying, tree planting and riverbank stabilisation. One farmer who values the support is Carron Craighead from Middle Coldcoats Farm in Ponteland who has been working with the Trust and its volunteers to plant hedgerows. Tyne Rivers Trust runs two facilitation funds in the north east region, on behalf of Natural England, with the aim of helping farmers to identify and make changes that help to reduce run-off into the river and connect up habitats for wildlife. Its lowland group has more than 65 members whilst its upland group has almost 30. The fund offers farmers support and advice in applying for the Countryside Stewardship scheme and by becoming a member, which is free, farmers benefit from a 20% uplift in points for their Countryside Stewardship application. Membership also opens up access to a range of workshops identified by the members themselves focusing on subjects such as soil health.